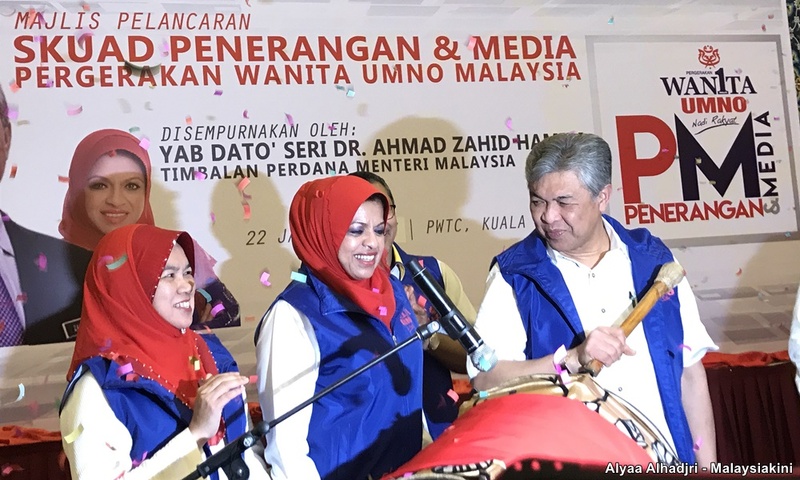 COMMENT | Caretaker deputy prime minister Ahmad Zahid Hamidi often takes umbrage at what Malaysiakini reporters and columnists say. Is he so fearful of power drifting away from him that he dares to make wild promises in public? Or Shahrizat Abdul Jalil, the Ketua Wanita Umno-Baru, who was not asked to contest in GE14, and for good reason. Is she privy to some information, which makes her an important asset to Umno-Baru? On Saturday, May 5, at a hustings in Bagan Datuk, Perak, Zahid told the audience that after the general election, and if BN won a two-thirds majority in Parliament, he would urge Najib Abdul Razak to give Shahrizat a ministerial post. He said that this was to reward Shahrizat for her loyalty to the party. A reward? A leader should never mislead, nor show a bad example for the rakyat. Malaysians will be puzzled why Umno-Baru leaders keep rewarding leaders who have allegedly been involved in embezzlement. 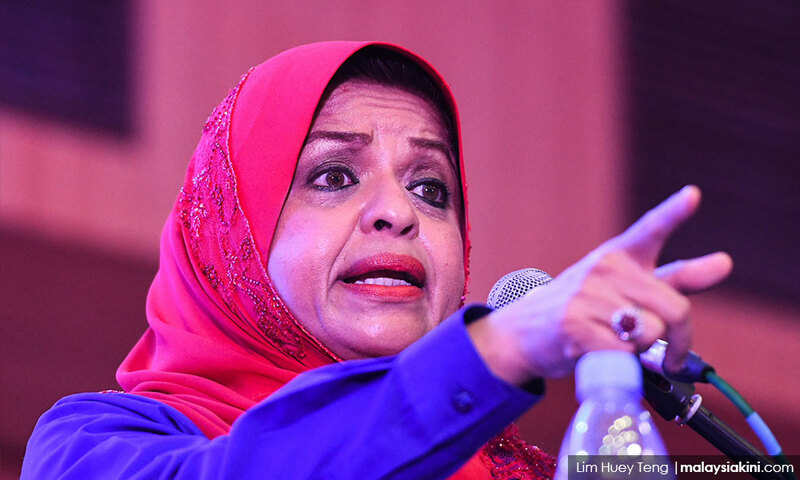 Shahrizat's husband and three children misappropriated RM250 million of the taxpayers' money, in what is known as the National Feedlot Corporation (NFC) scandal. The investigations revealed that the money did not filter down to the cattle breeders, but was used to purchase luxury apartments and cars. One must ask who is more desperate, and who has most to lose. Zahid or Shahrizat? What a pity that Umno-Baru's embattled politicians, each with their own sordid past, who climbed the greasy pole to their current posts, stick together in solidarity; but they see nothing wrong in using every trick in the book, to divide and rule the nation. Perhaps, all Zahid was doing was to "keep his enemies closer still". It is possible that Zahid was having a dig at the former minister for international trade and industry, Rafidah Aziz, who once crossed horns with Shahrizat (photo). In a serious blow and public relations defeat for Umno-Baru, Rafidah is now actively campaigning for the Opposition. Was the promise of a ministerial post, a signal to other embattled and unelected Umno-Baru/BN candidates, that if they showed their loyalty to the party, they would also stand to gain a senior position, in a future cabinet line-up, or at worst, become a minister in Najib's already bloated PM's Department? Zahid could have been adopting a tactical manoeuvre, to try to thwart more defections of former ministers, former heads of the civil service and former heads of the armed forces. Prominent individuals appear to be making a bee-line to stand in solidarity with former prime minister Dr Mahathir Mohamad and his Opposition line-up. Shahrizat has been tainted by the NFC scandal. For those who recall, the NFC is not the worst of her failures. Did she do her utmost to help the Penan girls who were raped by timber loggers in 2007? We appreciate her efforts to get a White paper started, but when it was obvious that the rapes had opened a can of worms, Shahrizat dropped the raped Penan women, like hot potatoes. As the minister for women, community and family development, her failure to see that the women received justice is unforgivable. Najib was right not to name her as a candidate in GE14. Umno-Baru would have "committed political suicide". Her ministerial position was due to Najib, and she is indebted to him. Or is she? In 2008, Shahrizat was defeated by Nurul Izzah Anwar. Abdullah Ahmad Badawi (photo), the PM at the time, felt pity for her, and made her a special advisor in the Prime Minister's Department. In 2009, when Najib became PM, he made Shahrizat a senator and the next day, swore her in as a member of his Cabinet. This senatorship is the only possible way for a person who has lost in a general election to enter the government. In other words, Shahrizat became a minister by the backdoor route. It should not be allowed to happen again because the rakyat is being robbed of its democratic rights. Worse still, if Zahid is allowed to carry out his promise, he will place a person, who did not contest in the election, in a ministerial position. We cannot have a person who is unpopular and linked to scandals to be in charge of policies which affect the rakyat and the nation. Najib and Zahid appear to be running so short of honest, decent and upright candidates in Umno-Baru that he has to recycle ministers. 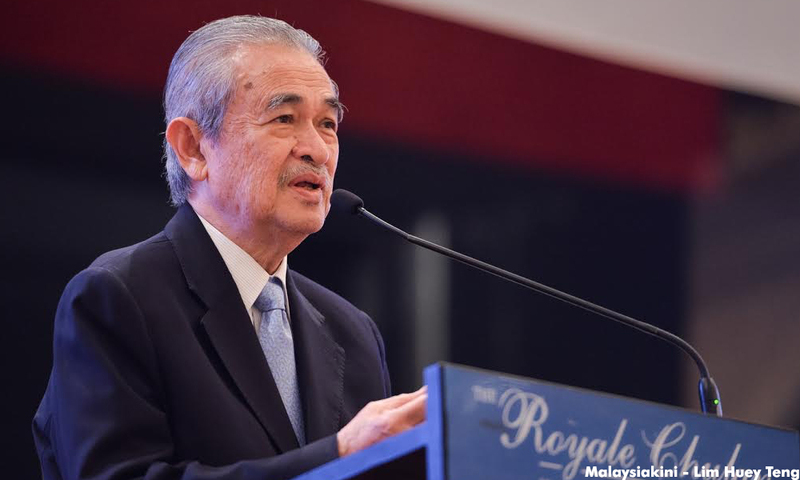 Recycled politicians, like Isa Samad, Tengku Adnan Mansor and Annuar Musa, repeatedly take charge of important institutions. Ironically, Umno-Baru appears not to take the recycling of waste products seriously, to save the environment, but recycles its tainted politicians with vigour, to keep their secrets safe and their band of brigands intact. Zahid is confident that Umno-Baru/BN will win GE-14. What does he know that we do not? Was the decision to win GE-14 at all costs taken when the National Security Council bill was enacted? If so, Najib has learnt much from Putin, the Russian president for life. Vote wisely, vote PH in GE-14.